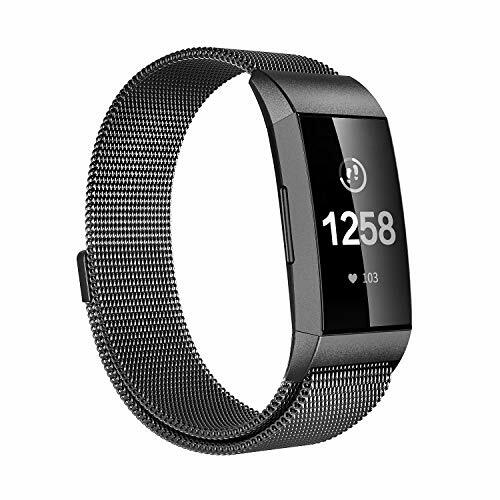 Crafts of this Fitbit Charge 3 band: 1.Woven on specialized machines, the smooth stainless steel mesh wraps fluidly around your wrist. 2.Built with superior material, repeated polishing supports you to wear for a long time with comfort. Compatible:Fitbit Charge 3 Fitness Tracker. Humanized design: Simple one strong magnet holds with band firmly, no closure need, surrounding your wrist safely and neatly. Material: Stainless Steel 316. What You Get: 1 x Milanese loop for Fitbit charge 3 100% Satisfied Service: Not only we make premium watch band, but also we provide excellent customer care. We never let our customers down. If you have any question with our product or service, simply send us a message via "Contact Seller". Your problem will be solved within 24 hours. The Fitbit Charge 3 replacement magnetic closure is strong so it leaves you with no worries about falling off your wrist at work or in the gym, elegant design can meet your needs in different situations.